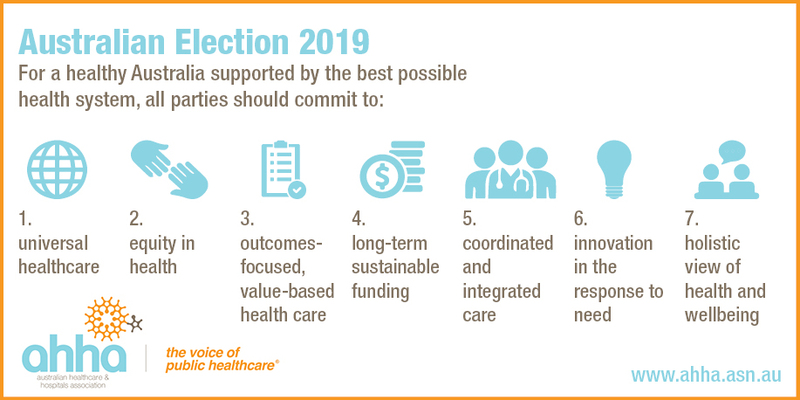 ‘Whoever is in government after the May 2019 federal election must have the courage to lead reforms to our health system to keep it effective, efficient and affordable’, says Australian Healthcare and Hospitals Association (AHHA) Chief Executive Alison Verhoeven. ‘Simply throwing new money at old problems will be doing current and future generations of Australians a disservice. The systems that have served us well in the past are struggling to cope with today’s demands of an ageing population, higher levels of chronic disease, and rapidly rising costs—including out-of-pocket costs—in the face of constrained budgets. ‘Governments will have to be smarter, more strategic, and working together in order to deliver a new, affordable, fit-for-purpose health system. ‘Strategic investment of public funds is what’s needed rather than pot shots of cash and band aid solutions. Strategy, not stimulus, is required to progressively reorientate our healthcare system to focus on patient outcomes and value rather than volume and vested interests. ‘This will not be an easy task—one recalls the fierce opposition from powerful vested interests to the establishment of Medicare, which underpins our public healthcare and hospital sectors, and is the foundation for universal access to quality healthcare in Australia. ‘Reforming healthcare cannot be accomplished overnight—but some areas need serious attention right now. ‘This is why we welcome the $2.3 billion investment pledged by Labor to reduce out-of-pocket costs and waiting times specifically for people with cancer. A diagnosis of cancer should not mean having to meet unexpected medical bills of many thousands of dollars a year or long waiting periods for care. We also applaud Labor’s commitment to reducing tobacco use: prevention must be part of every party’s health platform. ‘Similarly, we welcome the Coalition’s commitment to a national strategy to tackle excessive out of pocket costs charged by medical specialists. Transparency of information about costs will help reduce ‘bill shock’ although more needs to be done to reduce those out-of-pocket costs. ‘We also support the Australian Greens’ commitment to affordable dental care—this must be focused on outcomes and achieving value, with an initial boost for adult public dental health funding. Prevention strategies, including water fluoridation in all communities and a tax on sugar sweetened beverages, are also required. ‘In the medium to longer term, however, large structural reforms are needed across the whole system to deliver better healthcare access and affordability—and AHHA, in consultation with Australia’s best health leaders, has mapped out how to transform our healthcare system into a fit-for-purpose 21st century system. ‘Healthy people, healthy systems is a comprehensive blueprint for reform, available on our website. Among its many recommendations is a call for an independent national health authority to take the politics and finger-pointing out of health—similar to Labor’s proposed Australian Health Reform Commission. An early focus on value-based care, across the primary and acute sectors, is required. ‘Regardless of who forms government, all political parties should keep in mind a commitment to an effective, contemporary healthcare system is a commitment to a healthy Australia’, Ms Verhoeven said. The Australian Healthcare and Hospitals Association is the national peak body for public and not-for-profit hospitals, and community and primary healthcare services. This media release is available online.